This mirror monitor is compatible with all our built in wireless cameras which means all the wireless parts are built into the unit. This is also compatible to any car; it connects to any power source or a cigarette lighter. This mirror mounts by clamping on your current mirror and the clamps are adjustable so it will fit all cars. This mirror takes the place of the original mirror rather than clamping on like our other mirrors. The mirror also has an auto dimming feature. When installing the mirror it fits right onto the spot your current mirrors rests. 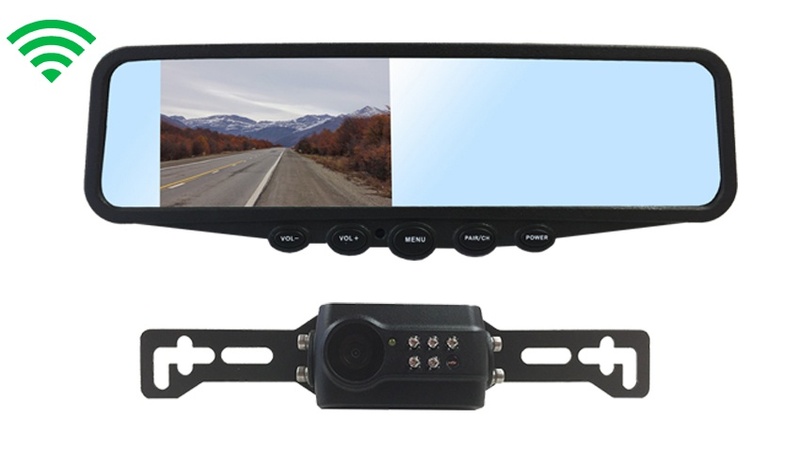 TadiBrothers digital wireless license plate backup camera is made from hard, rugged plastic that is built to last. It is 100% weatherproof, so don't stress out if starts raining – just set it and forget it. Installing this license plate backup camera is a breeze. You don't have to worry about drilling holes, installing mounting brackets, or modifying your van in any way. Just screw your current license plate screws through the camera's brackets and you are good to go. For even more added convenience, it is also wireless up to 150ft. All wireless parts are built into the camera housing so there are no extra parts to install your rear view camera. The 120° viewing angle is perfect for cars, trucks, and SUVs. A wide view of the right left, and rear of your vehicle makes blind spots a thing of the past. You can even adjust the exact angle that the camera faces to get the best possible view for your specific vehicle. The color mirrored image provides incredible picture quality so that you can focus on every detail, and the military-grade night vision ensures that you can use this camera whenever necessary. This versatile camera can be used constantly while driving or set to activate only when you are backing up.